Even before the founding in the 17th century of the French Academy of Sciences and the Royal Society of London, their members had corresponded so often with other European scientists that a great new invention was created -- the scientific journal. Thus the international character of science was firmly established and led to the Journal des Scavans and the Philosophical Transactions of the Royal Society. Price�s theoretical projections are shown in the slide. 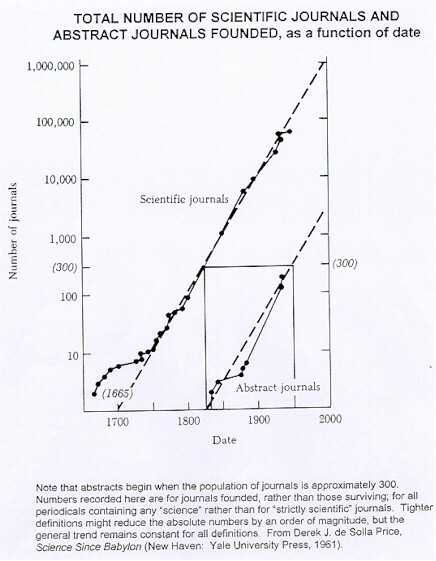 During the next few centuries, journals did multiply exponentially. But the growth rate in numbers of articles is even greater -- and is now over one million articles each year. Remarkably, however, world-wide output is concentrated in a relatively small number of journals. For example, just 200 journals produce 30% of the papers and 55% of the citations. Only 500 journals produce half the papers but 75% of the citations. This is sometimes referred to as the Law of Concentration. Another 500 journals are required to produce just another 10% of the citations. The remaining 15% are scattered in thousands of journals. These phenomena are the subject of Bradford�s "Law of Scattering." While French was the language of the Journal des Scavans and English was the language of the Philosophical Transactions, by the 19th century, the German language became dominant in science and prevailed up until World War II. French was used in the tsarist Russian and even after the revolution. German was widely spoken and used by scientists in the Soviet Union as well as the USA. As a young high school student, I studied German. But after the war, English rapidly replaced German as the second language of Russian, Japanese, and other scientists. While Russian was the primary language used in Soviet journals in the post-war period, leading Soviet scientists maintained regular contacts with foreign colleagues in English and German. An Honorary Degree from the Far Eastern University and foreign membership in the Academy of Natural Sciences epitomizes the words of the New Testament, Matthew 13:57 that "A prophet is not without honor, save in his own country and in his own house." Indeed, I have often felt more welcome in Eastern Europe than in my own country. In particular, I owe a great debt of gratitude to my old friend Victor Vaskovsky who was among the first Russian scientists to use the Science Citation Index® and Current Contents®, not only for information retrieval, but also for studying science. Time does not permit me to acknowledge all my Russian friends at the Institute of Marine Biology and in Moscow. My affinity for measurement in science clearly goes back to my contact with J. D. Bernal who published his "Social Function of Science" in 1939. I myself visited the USSR for the first time in 1961 and participated in the 6th International Congress of Biochemistry in Moscow. And I returned periodically over the next three decades. In 1965, I first met my dear friend Professor Vassily V. Nalimov, the inventor of the term "Scientometrics" at the Moscow Book Fair. He died earlier this year but it was my privilege to have published English translations of four of his books and I hope to see his autobiography titled Tightrope Dancer translated into English soon. In 1977, on one of my many trips to Russia, I traveled from Moscow to Vladivostok via the Trans Siberian Railroad with Victor Vaskovsky. As I said at the outset, my main theme today concerns the need for scientists everywhere to collaborate on an international and multi-national level. Numerous studies have demonstrated the positive impact of such collaboration on productivity and impact. These studies have shown that scientists are more productive when they collaborate both locally and internationally. My next two slides demonstrate the level of multi-national cooperation that has existed since 1974 between Russia and other countries. The data includes output for all Soviet republics before and after Perestroika. 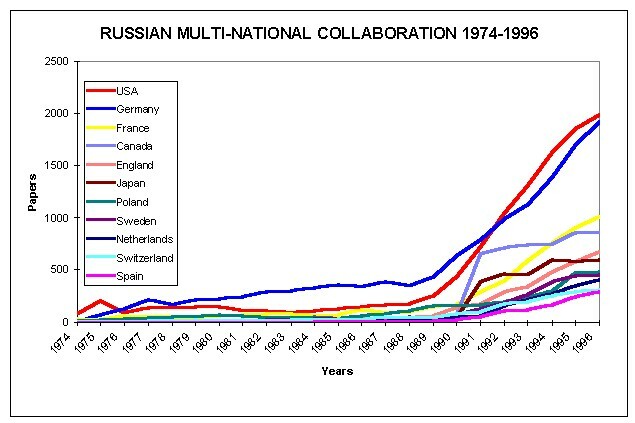 FIGURE 3: RUSSIAN MULTI-NATIONAL COLLABORATION 1974-1996. The red line on the next slide shows the extent of Russian-US multi-national cooperation from 1974 to 1996. In 1974, collaboration between the USSR and USA was essentially non-existent and remained very small until 1990. 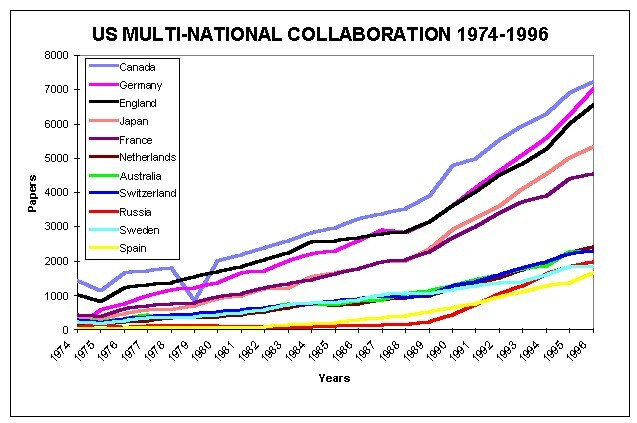 Since then the growth in collaboration is exponential. Today where there are about 2,000 papers per year published jointly by Russian and US scientists and probably nearly 8,000 per year between Russia and all other countries. In the second slide, you see similar trends for the USA and its multi-national partners. Canada and Germany and England are the leading partners. But probably 40,000 papers per year are multi-national collaborations. I might add that the US has long been the beneficiary of foreign-born collaborators immigrant scientists. I can well understand the desire of Russian scientists to communicate in their own language. This tendency is equally strong in all countries. However, Russian scientists should not feel that publication in English, the present lingua franca of science, is somehow denigrating. Our colleagues in Scandinavia, Germany, and even France today publish their most significant papers in international journals in the English language. Even more important than the question of language is the question of outside peer review. It is imperative that Russian scientists and journals introduce international peer review. This is easily facilitated by the World Wide Web. Furthermore, the Internet will eventually make it possible to introduce simultaneous multi-lingual publication without increasing printing and postage costs. Systems of automatic translation of Russian and English into other languages will facilitate this process. At the same time, it is essential that young scientists and students everywhere study foreign languages and cultures. Clearly there is a limit to the number of languages each of us can master. If we are to disseminate information widely it should be available in a universal language or in translation. Computer translation will also make it easier for those of us like myself who once read several languages easily but without regular practice must rely on translations. In a separate lecture this week, I will present a synoptic history and tutorial about the Science Citation Index which was conceived about 45 years ago. I stress the word tutorial because it is essential for university students to master techniques of information retrieval and management. Current Contents, SCI, and other databases have become an essential part of that process. Information discovery and recovery are not only important for the sake of those who wish to publish really novel research and review papers, but also for writing the history of contemporary science. While Russian science goes back to Peter the Great, Soviet science is a 20th century phenomenon and achieved many great advances which should be universally recognized. Using the SCI can help trace those histories. But to achieve a more complete history it would be essential to enhance the SCI with citation records for all Russian journals published since at least 1945. Such an enlarged Science Citation Index would be extremely useful. Professor Nalimov often spoke to me of such an important objective as well as a citation index to all Russian arts and humanities journals. Since Perestroika, there has been a dramatic change in the financial support that was previously given to Soviet science. While much of that support was related to the Cold War, it also had philosophical support in Marxism. I believe strongly in the importance of basic science, not only for its cultural value, but also as a vital engine which drives economic growth. Numerous studies have demonstrated the huge return to American Society from its investment in basic and applied research. In a democratic society, scientists, as well as all citizens, must speak up for their self-interests. Using citation analyses you can help demonstrate the impact of Russian science. I accept this honorary membership in the hope that the internationalist spirit in Russian science will continue to grow. I hope that the friendship between our two countries will flourish. I firmly believe that information dissemination will help you achieve economic prosperity through excellence in science and scholarship while preserving personal freedom.